Harry Potter Fan Zone caught up with Tom Felton (Draco Malfoy) and Rupert Grint (Ron Weasley) at the Harry Potter and the Deathly Hallows: Part 1 press junket in London last week, where they told us about some of their most memorable Harry Potter experiences. Harry Potter Fan Zone: Are you going to look back on the whole thing as one big experience or do you have a stand out film (Half-Blood Prince for example)? 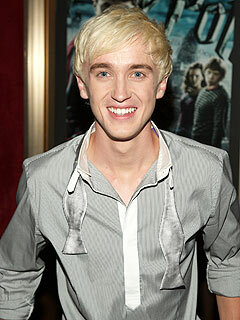 Tom Felton: Not really, it kind of all blurs into one. I don’t really remember saying goodbye and then coming back six months later. I just kind of remember it blending into one. Obviously, yeah, there are slightly different experiences. More to do with my age I guess. We were so young on the first ones. You don’t really question anything when you’re twelve or thirteen, you just get on with it and then kind of look back and think, “oh that was bizarre”. Certainly around that time that I mentioned this infatuation with filmmaking. It was that film, the sixth one, that really embedded that. Just being on set a lot more and working a lot closer with [David] Yates made it a lot more fun. Rupert Grint told us about some of his favourite ‘Potter’ memories, including the infamous slug sequence in Chamber of Secrets. Rupert Grint: I’ll never forget [the slugs]. I can still taste them! Am i right in saying i wish i could work with them?